A compass consists of a magnetized needle that can rotate freely on a pivot point. The needle aligns itself with the horizontal component of the earth's magnetic field line. The magnetized needle responds to any local magnetic force such as those generated by ferrous materials or by electromagnetic forces. Watches, batteries, ice axes / poles, electrical equiptment, power lines, GPS, cell phones, climbing equipment, vehicles, etc. should be tested to see if they affect the accuracy of the compass (i.e. cause any movement in the needle). Keep enough distance from these objects when using the compass. You may find the basic compass used in outdoors navigation go by different names, such as orienteering compass, baseplate compass (base plate), sighting compass, hiking compass, mountaineering compass, etc. Such compasses usually consist of: magnetic needle (north end usually colored red), transparent rectangular base plate, round rotating liquid-filled housing (dampens the vibration of the needle), graduated dial from 0 to 360 degrees on the circumference of the housing, orienting arrow and parallel meridian lines under the needle, index line for reading bearings, direction of travel arrow on base plate. 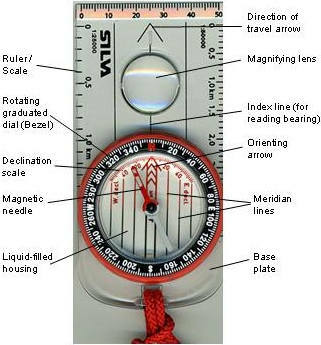 More high-end compasses might include: declination scale and adjustable orienting arrow for correction of magnetic declination, ruler with different scales on the base plate for measuring distances on map, magnifier on base plate, sighting mirror, clinometer (inclinometer) for measuring slope angles. There are also lensatic compasses used often by the military; however here we deal mainly with liquid-filled orienteering compasses with clear base plates popular for outdoors recreational activities. North (N), East (E), West (W) and South (S) are the primary cardinal directions. Northeast (NE), Southeast (SE), Southwest (SW) and Northwest (NW) are called ordinal, primary intercardinal or intermediate directions. 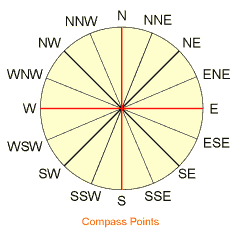 Additional subdivisions North-Northeast (NNE), East-Northeast (ENE), East-Southeast (ESE), South-Southeast (SSE), South-Southwest (SSW), West-Southwest (WSW), West-Northwest (WNW), North-Northwest (NNW) are called secondary intercardinal directions. For any precise measurment of bearings necessary for outdoors navigation, the azimuth or quadrant bearings rather than cardinal / intercardinal directions are used. 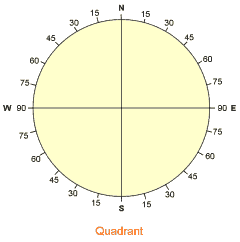 In this method the compass dial is divided into four quadrants, namely NE, SE, SW, and NW. North and south are at 0 degrees, and depending on the quadrant, angles (up to 90 degrees) are measured away from north or south (whichever is nearer) towards East and West directions. For example since Northeast (NE) is 45 degrees towards east of North, using quadrant notation it would be N45°E (read North-45 degrees-East). Similarly NNW is equal to N22.5°W. ESE is S67.5°E. The compass dial is divided into 360 degrees. North is 0° or 360°. Angles are measured clockwise from North. Therefore East is 90°, South is 180° and West is 270°. Converting azimuths to quadrant bearings or vice versa is easy. 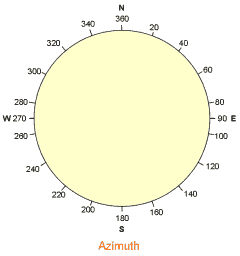 For example an azimuth of 140° is greater than 90° and less than 180°, therefore it is in SE quadrant. There are 180 - 140 = 40 degrees between the South and the point, therefore the quadrant bearing is S40°E. Similarly 287° (greater than 270° and less than 360°) is equal to N73°W. A quadrant bearing of S37°W is in the SW quadrant and is equal to an azimuth of 180 + 37 = 217°. Military lensatic compasses use mil (milliradian) as a measurement unit instead of (or in addition to) degrees, with their dials usually divided into 6400 mils. Sometimes you may see a compass rose on a map. The circles in a compass rose may be graduated in degrees from 0 to 360°, or they may show cardinal and intermediate points. The compass rose in nautical charts usually has two graduated rings in degrees, with the outer ring representing true bearings (referenced to True North) and inner ring denoting magnetic bearings (referenced to Magnetic North). When we take a bearing with a compass, the horizontal direction angle is measured clockwise relative to true north, magnetic north or grid north. More on compass bearings and navigtion will be covered in a future section.